Cedar Hill advanced to the third round yesterday, on a perfect day for football at Dragon Stadium in Southlake, outlasting Denton Ryan, 48-35. It was a very entertaining game and, as always, I’m just amazed by the talent I see in Texas and 5A football in the metroplex takes the usual Texas talent to another level. Ryan had no answer for the Cedar Hill offense. On the ground and through the air, the Longhorns scored quickly and almost every time they touched the ball. I’ve had the pleasure to watch this team three weeks in a row, and each time they have looked a little better on offense. They seem to be clicking at the right time and they look like a very confident group. Cedar Hill took a 14-0 lead before the Raiders ever touched the ball; recovering an onside kick after scoring on their first possession, the ‘Horns quickly scored again. From there it was a track meet with both teams trading touchdowns. Ryan scored on some broken coverages and several trick plays to stay in the game until the final minutes. In the end, Cedar Hill’s defense made three stops, one in the first half and two in the second, and that made the difference. 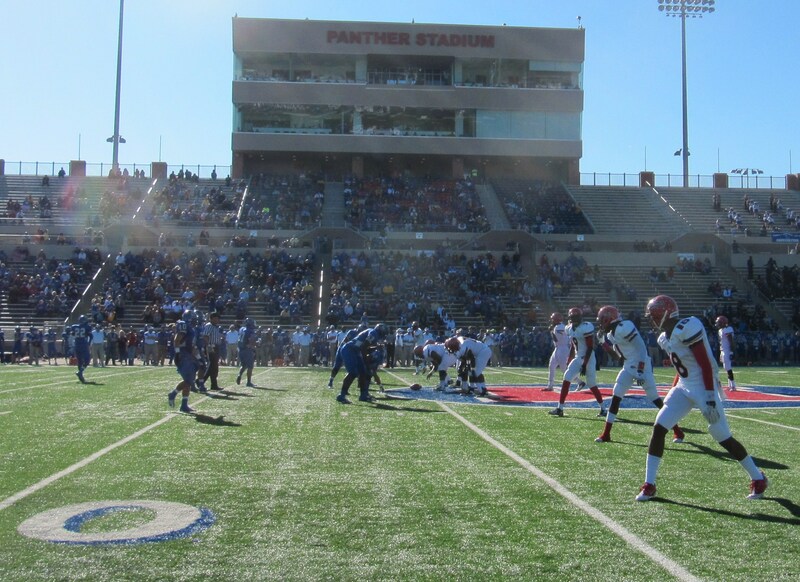 The win sets up a third round game between Cedar Hill and Arlington High next Saturday. As entertaining as all the football was this weekend, I’m not sure about the current trend of the game. This was the second game in a row I saw WITHOUT A PUNT. Not that anyone gets excited about watching punts, but the balance between offense and defense has gotten out of whack. Football has always been kind of a pendulum between offensive and defensive tactics. Offense coaches find new ways to move the ball down the field, other coaches copy those methods and scoring goes up. Defensive coaches than come up with new ways to attack the offense, coaches’ copy and scoring goes back down. The problem is, nobody has yet figured out a consistent way to shut down the spread. This offense spreads the field vertically and horizontally, simplifies assignments, gives the quarterback the ability to take advantage of mismatches and puts the best athletes in open field where defenders have to make decisions that can never be right. Play aggressive and this offense will kill you with screens, hang back and the quarterback will have time to pick apart your coverage and find a receiver. ‘Backers read keys and the QB reads (options where the QB can either hand off the ball or pull it out and run.) will blow up. I don’t have an answer, it will take a defensive coach a lot smarter than me to come up with the next big evolution and I don’t see it on the horizon. After the game I drive to Early, about 2 hours southwest of the Metroplex, hoping to get there in time for the 2nd half of the Throckmorton game against undefeated Water Valley. Fortunately/unfortunately this game was, unexpectedly, a blowout. Throckmorton was up, 46-8 when I arrived at the half. The mercy rule ended the game a few minutes into the 3rd quarter as the Greyhounds won 62-16. I’m going to be tying up loose ends in West Texas; then to Wichita Falls on Thursday for Stamford- Quanah in their 1A game. Stamford has been playing very well; I’m looking forward to seeing them again. From there it’s down to Houston to see La Marque play the undefeated and top ranked team in the 3A, Navasota. This coming Saturday will be a tough decision; Cedar Hill-Arlington and Abilene-Hewitt Midway are both in the metroplex and at the same time. I hate to miss either one of them. Also have to miss Carthage and Throckmorton again. Hopefully they all will keep winning and keep giving me tough choices to make. Of the four games I decided to watch this weekend, this was the one I thought might be a blowout. On paper, 11-0 Abilene, going in against a 6-5 Lamar looked like a mismatch. This is the amazing thing about 5A football in Texas, like the NFL, teams with poor records are still dangerous and can knock off a powerhouse if the favorite gets complacent. The Abilene Eagles did advance to the 3rd round with a 53-34 victory at the University of Texas-Arlington, but not before getting a scare from the Vikings. Abilene took an early lead with 2 quick scores to go up 14-0, but Lamar came right back scoring three unanswered touchdowns in the 2nd quarter, to take the momentum and the lead, 20-14. Both were short lived, as the Eagles put together a drive late in the half, capping it with a 22 yard touchdown pass from Evin Abbe to Nate Kittley with 33 seconds left, to make the score 21-20 at the half. 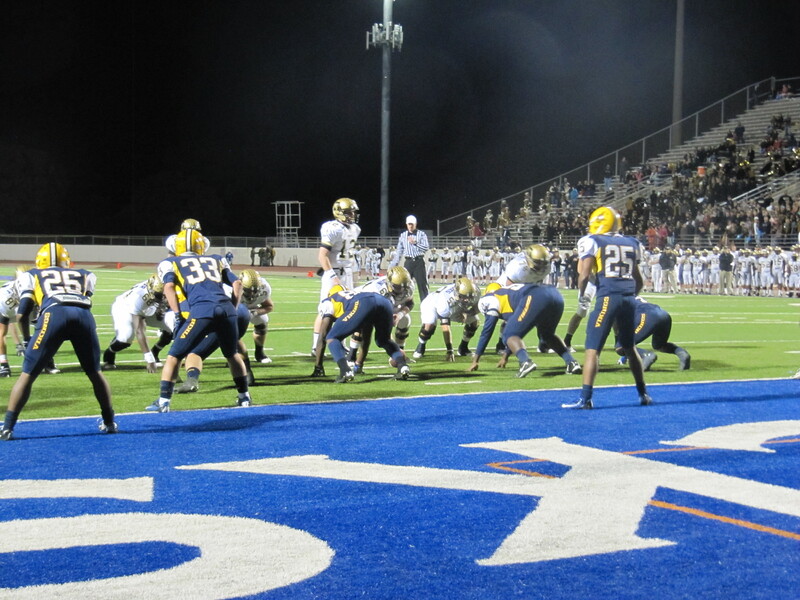 Abilene increased their lead when Kittley took the 2nd half kickoff 99 yards for a TD and a 28-20 Eagle lead. Lamar wouldn’t go away, trading scores and staying on the heels Abilene through the 3rd quarter. Abilene finally pulled away in the 4th quarter when the Viking offense sputtered and the Eagles continued to put points on the board. The Abilene offensive line did an outstanding job and running back Marcell Porter ran for over 200 yards and 3 touchdowns. Impressive crowd of maybe 4,000 from Abilene made the over 100 mile trip to see their team, easily tripling the attendance on the home side. Another good example of what I talked about last week when writing about the importance of support from the fans and how it leads to success. I’m looking forward to watching Abilene again next week, who along with La Marque, Carthage and Stamford advanced today to the 3rd round. I’ll be hoping for my other teams, Cedar Hill and Throckmorton to win their games tomorrow and will let you know how those go. For the first time in four years the Aledo Bearcats ended a season without a championship, falling in their 2nd round game to Denton Guyer, 42-30. With the wind at their back, Guyer dominated the 1st quarter jumping out to a 21-0 lead. The Bearcats got on the board in the 2nd quarter on a 15 yard pass from Pate Davis to Willie Gibson. Aledo added a safety on a bad snap by the Wildcats early in the 3rd quarter to make the score 21-9 and it looked as though the Bearcats might make a run. Unfortunately for Aledo, whenever they started to look like they were getting something going they found a way to shoot themselves in the foot. Dropped passes, overthrown balls & big defensive letdowns all kept the Bearcats from climbing out of the hole they found themselves in. Not to take anything away from Guyer, they are an outstanding team and outplayed Aledo. Guyer quarterback Jarred Heard, a University of Texas commit, was the best player on the field and hurt the Bearcats both through the air and on the ground. Aledo could have won, but would have had to play a lot better than they did, and on this day they just made too many mistakes to beat a team as good as Guyer. Sad to say goodbye to Aledo, Idalou, Port Lavaca Calhoun and Harlingen; they are all great programs I spent time with and all went down today. With ten teams that I spent time with still playing, I had a good problem but also a tough time coming up with who to watch in the 2nd round this weekend. I’m very tempted to head down to Houston and see the La Marque- Coldspring game, the Sandcrabs from Calhoun are going to be in San Antonio, and that was also tempting, but I got to stay with the way to see the biggest number of my teams during the weekend, and that means staying in the Metroplex. I’m gambling that La Marque will get by Coldspring this time and hope to get down for the Navasota game next weekend. Friday, I’ll be at the match between two great 4A schools Aledo vs. Denton Guyer. Afterwards I’ll head down the road to Arlington to catch the game between Abilene High and Lamar. On Saturday, I’ll be at Dragon Stadium in Southlake to see the Cedar Hill Longhorns play Denton Ryan and finally I’ll drive out to Early to try to catch some of Throckmorton’s game against Water Valley. I sure wish there was a way I could see the rest of my teams, I just got to hope they all keep winning so I can see more of them in the 3rd round. There are just too many good games to see, there have got to be a lot of Texas HS football fans with tough choices to make. The Cedar Hill Longhorns began their playoff run at Hewitt Midway near Waco defeating the Copperas Cove Bulldawgs 35-28. The ‘Horns came out very strong, running the score to 35-7 late in 3rd quarter. The ‘Dawgs showed some fight in the 4th quarter,, scoring 3 unanswered touchdowns and getting a failed onside kick away from having a shot for a tie in the final minutes. Copperas Cove deserves credit for the comeback, but the bottom line is that Cedar Hill was, by far, the superior team.They have so many ways to hurt you that, I‘m guessing, they will go as far as their execution takes them. When they play their best football they are very hard to beat. I’m heading home to Reno in a few hours I’m very excited to spend a few days with my wife, daughter, granddaughter and dogs after spending 4 months living in motels. I will be returning to Texas on Thanksgiving, in time for the second round. All ten of the playoff teams I’ve followed this year survived to the 2nd round, so I have some decisions to make about where to go. Make suggestions or check back later in the week if you want to know where I’ll be. The Aledo Bearcats dominated every aspect of their game against Cleburne last night in Mansfield; scoring on the ground, through the air and on defense, and defeating the Yellowjackets 45-7. The Bearcat offense was impressive last evening, the line did a big job controlling the line of scrimmage, opening up big holes for the running game. On defense the ‘Cats picked off 4 Yellowjacket passes, including one for a touchdown, and gave up almost nothing on the ground. 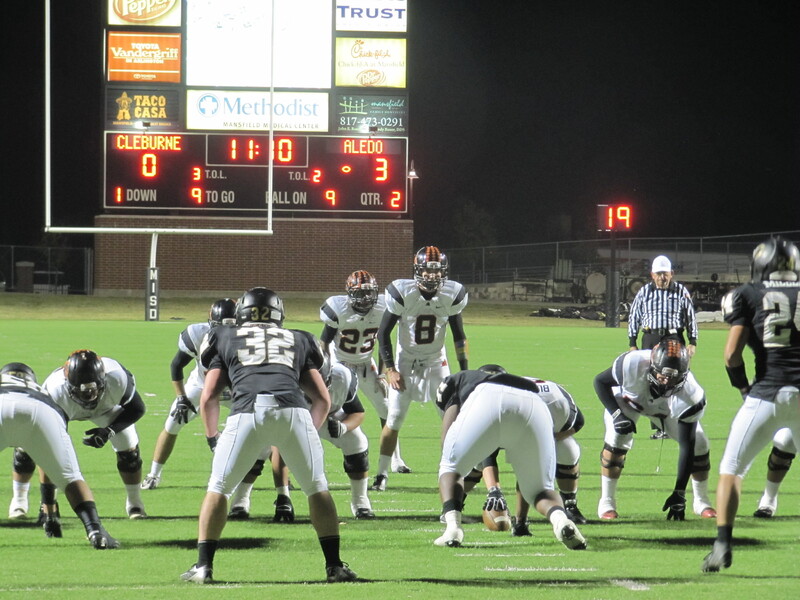 On special teams Aledo, blocked a punt, had some big returns and pinned Cleburne deep on many kickoffs. Quarterback Pate Davis played an outstanding game, throwing very well, but also doing a great job with his feet. We’ll find out next week when Aledo matches up against top ranked Denton Guyer, but I wonder if the Bearcats have been overlooked a bit. Everybody seems quick to attribute so much of their past success to Jonathon Gray that some might not have noticed how good this team is. They are very solid everywhere and don’t make many mistakes. I haven’t seen Guyer and it’s hard to say that the Bearcats aren’t being given their due respect, but I wonder if some are too ready to see them go down. The La Marque Cougars took their first step towards a sixth championship, dominating Houston’s Furr High School 54-0 at Barnett Stadium. This sets up a probable rematch between La Marque and the one team to defeat the Cougars this season, Cold Spring-Oakhurst next Friday in Reliant Stadium. For La Marque to win their 6th championship, they likely will have to fight through three great teams in consecutive weeks and get out of a very tough Region III. After Coldspring, the Cougars would likely face the top ranked team in the state, Navasota, then possibly another power in West Orange-Stark in the region final. With the expectation of the very tough road to come, a blowout like they got tonight might have been exactly what the Cougars needed. La Marque was able to rest kids, let some bumps and bruises heal and give some of their young kids a lot of playing time. What really stood out tonight for me was the contrast between a strong program and one that suffers from the lack of much of what makes Texas football so special. The big multi-school ISD’s of Dallas, Austin and Houston, don’t have the same support most programs in this state enjoy and tonight was a vivid example of what that difference means on the field. During my trip I’ve tried to learn what quality programs have in common. The most important similarity I’ve seen in all 11 programs I’ve followed is they all have great support. When a community really cares about the quality of the program, school board members are elected with the same values and the board hires a superintendent who supports the football program from above. This dynamic is one of the main factors in what makes the Texas model successful. In places like the Houston ISD however, the model has broken down. The public doesn’t care and so the administration doesn’t care and athletics become a low priority. Despite, having basically a home game, Furr had just 62 fans in the stands at kickoff. 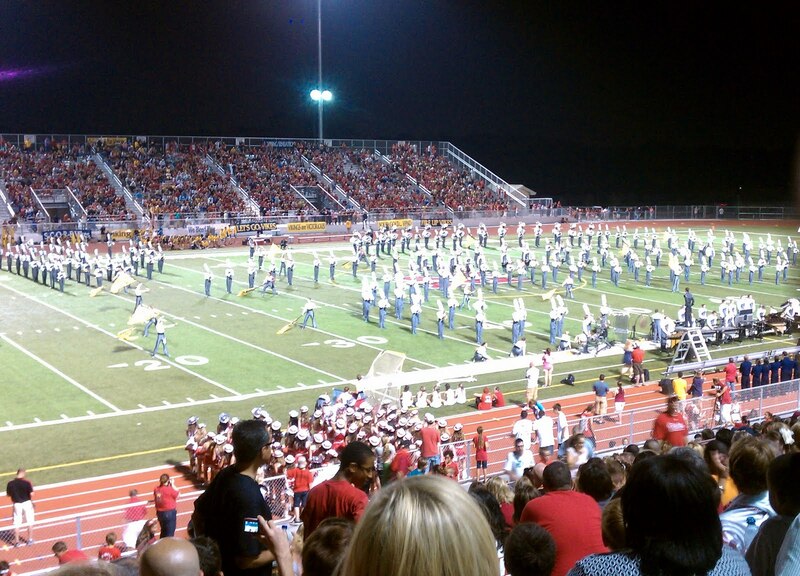 (I counted), while La Marque brought maybe 2000, (too many to count). La Marque brought up a lot of JV and freshmen and dressed around 80; Furr dressed 27. Texans, if you want to know what football is like in the rest of the country, and where your football is headed if you ever lose such things as athletic period and the requirement that all your coaches also be teachers, just look to schools like Furr from big city ISD’s. While good enough to go 6-3 in their district against similar schools, they were overwhelmed in every way by a school that makes football a priority. It was great to see the kids and coaches at La Marque again, the Cougars were inexperienced and sloppy when I last saw them in week zero and looked much more polished during practice yesterday and during the game tonight. The La Marque coaches do a great job and run a very disciplined program. They are a pleasure to watch. Lots of playoff games to pick from. 10 of the 11 teams I’ve been with are in the playoffs, so I want to hit as many as I can each week. I will be heading to the Gulf the day after tomorrow to catch La Marque open the 3A D-2 playoffs against Furr HS on Thursday. 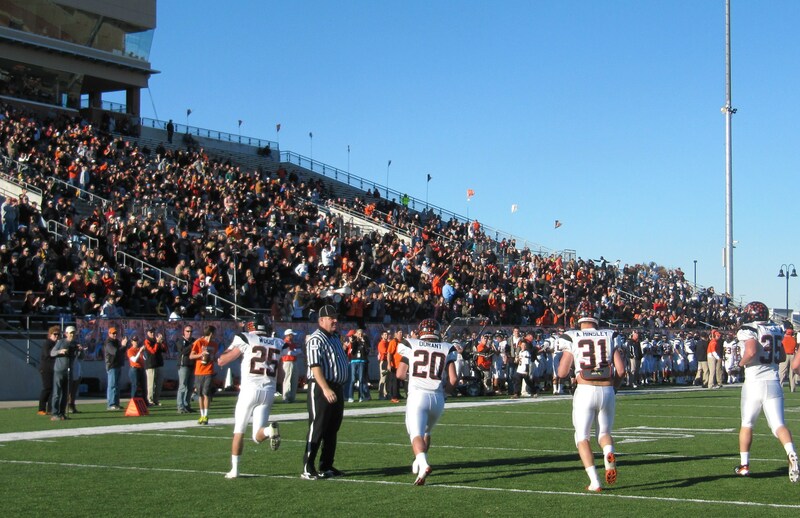 Then it back to the Metroplex for the 4A-D1 matchup between Aledo vs. Cleburne Friday night in Mansfield. 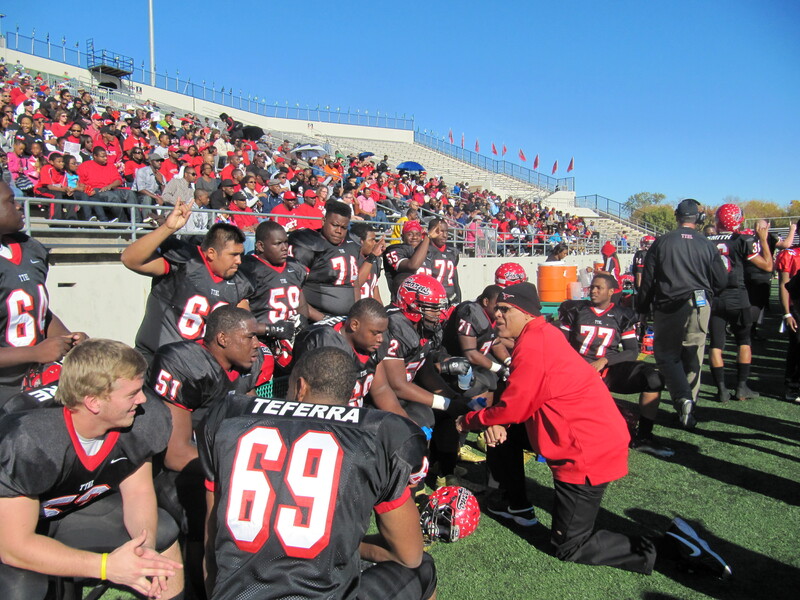 Finally on Saturday I will travel with Cedar Hill to Waco where they’ll meet Copperas Cove in the 5A-D2 opener. Best of luck as well to Abilene, playing El Paso Montwood , Harlingen hosting McAllen Memorial, Port Lavaca Calhoun vs. Floresville, Carthage playing Palestine and Throckmorton vs. Rotan. Both Idalou and Stamford have byes. Hopefully you’ll all keep playing long enough for me to get the chance to see you. Sunday morning, I’m flying home for the first time since coming to Texas in July. I’m very excited to get back, see my family and sleep in my bed for the first time in months. My wife has been very supportive of this project, but it’s a hard slog and as much as I love what I’m doing it will be great to get home. I’ll get back to Texas on Thanksgiving Day, in time for the 2nd round playoff games. The next six weeks are like Christmas for fans of Texas high school football. Starting late Friday night when the brackets could go from ‘projected’ to official, coaches and fans could finally try to make sense of the lay of the land. 576 teams from all corners of the state will begin competing Thursday for the 12 University Interscholastic League (UIL) state championships. Private schools, with the exception of the two playing UIL started their tournaments last week. Unlike most places, each game site and officiating crew is predetermined by the coaches of the competing teams. Most often the games are played at a neutral site. The more popular sites may be used more than once on a weekend giving fans the added bonus of seeing multiple games during the weekend. For example, in Dallas this weekend, eight 5A games will be held at Cowboy Stadium. Classifications: 1A through 5A are the five classifications based on school enrollment. Each classification is further divided into D-1 and D-2 also theoretically by enrollment. 1A schools may also chose to play 6-man football instead of 11, creating two additional 1A brackets. 12 champions will be determined. Six-man football division one and two will play their championships the weekend on Saturday, December 15th in Abilene. All ten of the remaining championships, 1A through 5A D-1 & D-2, will be played in Cowboy Stadium in Arlington; 3A, D-1 on December 14th, the other 9, to be played in three tripleheaders December 20-22. Divisions: Like classifications, divisions are theoretically grouped by school enrollment, 5A D-1 for the largest schools all the way down to 6-man D-2. Determining who will qualify among the small schools, six-man through 2A is very straightforward. Districts or leagues are built geographically and by enrollment and the top two from each district is plugged into the bracket. 3 to 5A is where things get confusing. During the regular season there are no 5, 4 or 3A divisions. Teams are grouped into districts based on proximity to the other similar sized schools. After district play, the top four (3 in 3A) are inserted into a bracket based on the enrollment of each qualifier in their district. The district schools with the top two enrollments go D-1 and the schools with the lower go D-2 (in 3A it’s one D-1 team& two D-2 teams). Since some districts have much larger schools than others this arrangement creates a lot of issues. District 10-5A is the most glaring example of this. 10-5A is home to four of the largest schools in the state; Plano East (6016 enrollment), Plano (5315), Allen (5833) and Plano West (4945). With both Allen and Plano making the playoffs, Plano West will play in the D-2 bracket despite having more students than all but two of the D-1 schools. During the final weeks, many teams, even clinched district champions, must scoreboard watch to find out if they will be going D-1 or D-2. It’s completely out of their hands, but may well be the difference between a championship and an early exit. Districts: In most states known as leagues. 5A though 3A each have 32 districts across the state of Texas. 2 and 1A have 16. Regions: The districts are grouped into 4 geographic regions, starting in the far west part of the state. Region I (districts 1-8) begins in Far West Texas (El Paso) and include the west and northwest part of the state to the west part of the DFW Metroplex, Region II (districts 9-16), include the rest of the Metroplex, parts of central Texas and East Texas to the Louisiana and Oklahoma border. Region III (districts 17-24) is Houston and part of Central Texas. Region IV (districts 25-32) is San Antonio and all of South Texas. These regions are not absolute and vary somewhat by classification. They also change every two years when the UIL realigns. Realignment: In even number years, classifications, districts and regions are realigned based on updated enrollment figures. In the big-city suburbs, schools can quickly move up or down based on new development and school openings. In much of rural Texas, schools are generally shrinking as the population shifts to those suburbs. Brackets: These look exactly like NCAA basketball brackets. The teams are plugged in according to their district and whether they are one or two seed in such an arrangement where the district 1 top seed will open against the district 2- # 2 and so on. The talent in certain districts is far tougher than in others so the road to a championship is very much up to a teams’ position on the bracket. The top two teams in the state may face off in the first round while another contender skates though the early rounds against easier opponents. Like the division separation, a teams’ draw in the bracket is uncontrollable and has a lot to do with ultimate success. If you get the idea luck plays a big role in winning a championship, you’ve got my point. Officials’ calls, injuries, seeding and the bounce of the ball all need to go a teams’ way for them to survive though such a tough field. This isn’t to say the teams who make it to the title are unworthy. Winning six games in a row is never easy, but gets even tougher when each win means a more pressure packed game against a team who’ve also made it through the gauntlet. Probably not my most interesting post, but I hope explained what’s coming up from now through December 22nd.